How many times have you made a purchase based on the advice of others? Whether polling Facebook for recommendations from “friends” or relying on the reviews of strangers online, today’s consumers value the advice of others when making purchasing decisions. Believe it or not, this idea of sharing opinions and experiences with a product or brand is a form of marketing. It’s called Word of Mouth Marketing —WOMM for short. Recognized as the most powerful and influential form of advertising, WOMM has taken the world of emerging media by storm as an effective and inexpensive way to get consumers excited about a product. Obviously, social media plays a key role in WOMM, enabling companies to get the word out about new products faster than ever. It also allows customers to share good — and bad — experiences or reviews, which can both help and hinder a brand’s image. So how does a brand generate the best WOMM it can? Why, with the Three E’s of course! Engage— Brands need to be interactive on social media. Listening to consumers, answering and asking questions are all great ways to solve problems, gather ideas and generate positive conversation around a brand. Equip— It’s important for brands to give consumers reasons to talk. From awesome products to stellar customer service and interesting stories, there are many ways to generate a buzz around a brand. The trick is to know what consumers are looking for and give it to them! Empower— Brands find success in WOMM when they give consumers multiple platforms to talk about the brand and share what their thoughts and experiences. Letting people know that their thoughts and opinions matter is a great way to stimulate consumer conversations. WOMM is especially important when marketing to the millennial demographic. Millennials are a very aware and engaged group of consumers, but they do not respond well to traditional methods of in-your-face marketing. Likewise, they value the opinions of other consumers more than anything else and usually base most of their purchase decisions on past buyer experiences. Therefore, getting satisfied customers to spread the word about a brand is key to marketing to this group. Recently, I participated in a Facebook contest for Valentine’s Day on the LaCroix Water Facebook page. It was super simple to enter — you just had to like the company’s Facebook page and comment on the post about the contest. The prize was a Coach wristlet with heart graphics, a perfect prize for those looking forward to Valentine’s Day and a great way to spice up the cold winter month of February. The winner was selected at random and low and behold, it was ME! I WON! WAHOO! LaCroix messaged me via Facebook, I provided my mailing info and BOOM — the very next morning the adorable wristlet arrived at my door. I then felt obliged to take a photo of the prize and share it on my Facebook page, making sure to thank LaCroix Water by tagging them in the post and using brand- and contest-appropriate hashtags. After a day, my post received 25 “Likes” and generated five comments from my Facebook friends. This made me think: I know what I got out of the contest, but what did LaCroix Water get out of it? A stronger brand community. Contests are a great way to build a community around a brand. People who have never heard of the brand may have discovered it because someone shared the contest on their social pages. More than likely, the post I created once I received the prize Social media contests exposed a few people new people to LaCroix Water, or at least my tag sent them to their Facebook page. This contest was a good way for LaCroix to interact with consumers on a personal level — as it required one to share his or her most memorable Valentine’s Day experience. In turn this experience can stimulate customer loyalty — I know I will continue to purchase LaCroix Water. New followers. Contests are great incentive for brands to garner “likes” or followers on their social media pages. In this instance, you had to “like” the LaCroix Water Facebook page and comment on the contest post in order to be eligible to win. Increased page exposure. When someone “likes” a page and comments on a post, this activity can show up on their personal page and there is also a good chance it will appear on the feeds of their friends. Therefore, LaCroix’s contest likely increased brand exposure on the social network. So what are your thoughts on social media contests — from either a brand or consumer perspective (or both)? Share your experiences in the comments below. Over the past decade, social media has revolutionized almost every aspect of human life. From education and networking to news and everything in between, services like Twitter have not only changed the way we communicate, but how we learn and interact with the world around us. For this particular post, I’d like to explore the wide world of Twitter and it’s video counterpart, Vine. Twitter is an online social networking service that allows users to “Tweet” and read news, thoughts, opinions and anything else that can be shared in 140 characters or less. The social network has approximately 288 million monthly active users, eighty percent of which use the service from a mobile device. Supporting over thirty-five languages, Twitter boasts that seventy percent of its active accounts are located outside of the United States. A staggering 500 million Tweets are sent out each day, 80 percent of which are sent from a mobile device. Twitter is responsible for the hashtag revolution as well. A hashtag, or pound sign (#) followed by a keyword or phrase helps to categorize Tweets and make them searchable. A hashtag can be used at the beginning, in the middle or on the end of a Tweet and those that become very popular often are related to trending topics (e.g. : #superbowl, #grammys, etc.). Twitter’s video counterpart, Vine, was introduced in 2013 and allows users to create and share short, six-second, looping videos. Like Twitter’s limited character quality, Vine’s short time threshold inspires users to be creative in capturing image and sound. The social media service has taken off, growing exponentially in its first year. Today, it is widely used around the world by more than forty million users. These two social media platforms are great ways for companies to interact with consumers, spread the word about their products and build brand loyalty. Building brand buzz with Twitter and Vine can be successfully done by optimizing one’s Twitter and Vine bio, creating clever content and posting regularly, retweeting and using trending hashtags. Showing creative content on Vine can also be used to help humanize your brand, demonstrate a new product and show people what your brand is all about. No shopping cart left behind: Are you guilty of giving online shopping carts a complex? Does your shopping cart suffer from abandonment issues? A week ago I was shopping a sale online at Old Navy. I had loaded several items into my cart, got distracted and before I knew it the window to receive an extra 30 percent off my purchase had expired. So what did I do? I closed the browser tab and went on my merry way. Libby, Your Shopping Bag Has Abandonment Issues. Truth is, I was guilty of leaving a virtual shopping cart, filled with innocent sweaters and dresses, to linger in the abyss that is the inter webs. But I’m not alone. Approximately 67 percent of online shopping carts suffer abandonment issues. In 2014, an estimated $4 trillion worth of goods was left to rot in virtual shopping carts around the web, leaving the online retail industry frustrated and confused. According to Statista, Of those who abandon online purchases, 56 percent do so because they encounter unexpected costs during checkout that make them rethink their order, such as taxes, fees and shipping charges. 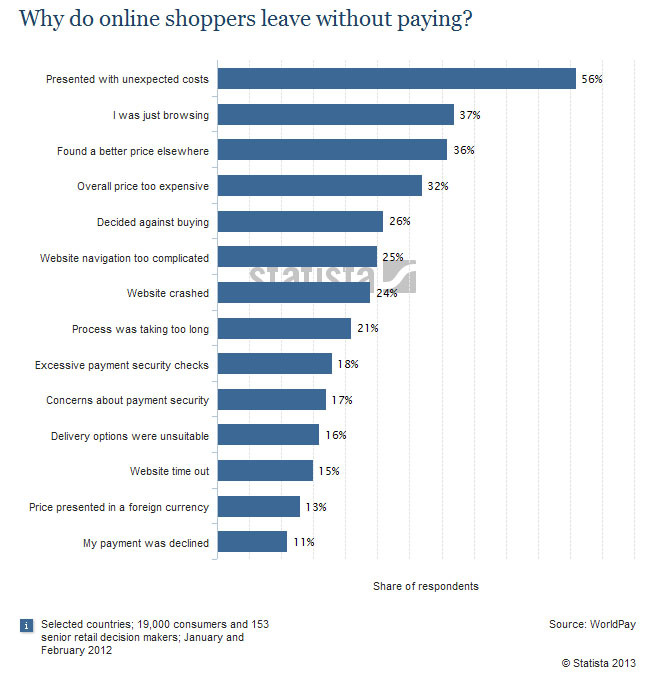 Below is a chart showcasing the main causes reasons consumers ditch their carts at checkout. What can be done to stop this marketing epidemic in our increasingly digital world? 75 percent of shoppers guilty of abandoning online shopping carts claim they plan to complete the purchase later, either online or through another purchasing platform, such as over the phone or in store. Streamlining the checkout process will greatly reduce the abandonment rate for online retail purchases. Retargeting shoppers by sending reminder emails, containing a link to the shopping cart, within three hours of ditching goods can benefit retailers. Studies show these emails have a 40 percent open rate and a 20 percent click-through rate. Marketers can take a neglected cart as a sign that the consumer is extremely interested in their brand and product. Often, the act of leaving goods behind online is part of the purchase process for consumers.